A pizza is a blank canvas, awaiting the artist to approach with a colorful pallet of toppings to design an expressive culinary masterpiece. 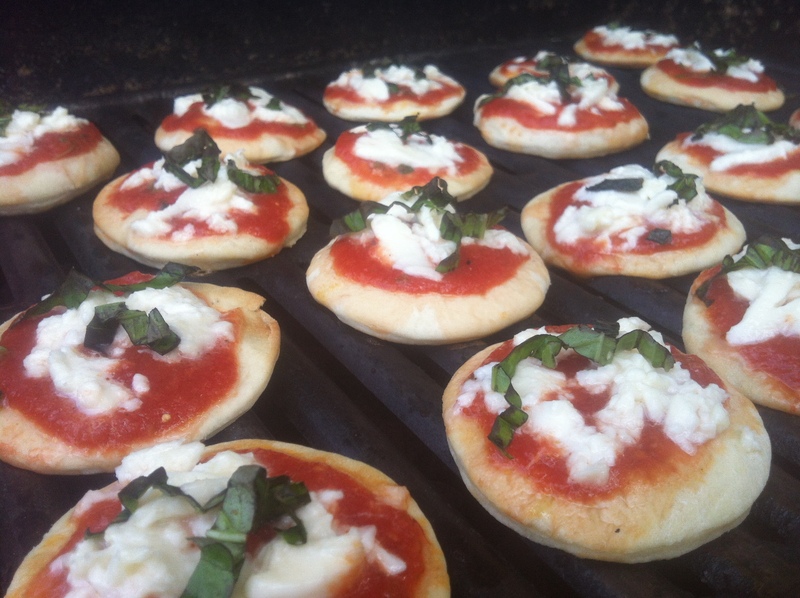 Grilled pizzas are an excellent way to make your next summer BBQ a little unexpected, but a lot of fun for all of your guests. By grilling this authentic Italian pizza crust recipe, along with the simple, robust tomato sauce and creamy fresh mozzarella, guests are treated to a bite of real Italian pizza – crisp thin crust with a ‘wood-fired oven’ taste. Carnivores, herbivores, and omnivores are all comfortably welcome at your Grilled Pizza Party, since everyone is charge of their own creation – you provide the crusts, the toppings, and the fun. I suggest small bowls (as many as you can handle) of topping choices – prosciutto, mushroom, artichoke, peppers, figs, onions, cooked sausage, various cheeses (ricotta, provolone, fontina), multiple sauces, including pesto, garlic and olive oil – release your inner “Pizzaiolo” (the Italian word for a pizza maker). This is an excellent way to bring everyone together, but also gives you time to prepare in advance so you can actually enjoy the party. You cater the sizes of the pizza accordingly, from mini’s to 8″ rounds – serve alongside several sides and salads (salumi, antipasti, arugula with shaved Parmiggiano or traditional caprese, etc.). The most important thing is to have fun…and eat well. Buon Apetito! In a large bowl, whisk the flour and salt together and set aside. In a small bowl, add the yeast to the water, stir with a fork, then add sugar. Allow yeast mixture to proof for about 10 minutes (until foamy). Add to the flour mixture along with the olive oil. Mix with your hands, kneading the dough by folding it over and pressing down with your knuckles, until all of the flour is well incorporated, forming a sticky dough ball. Cover with plastic wrap, then a few kitchen towels, and allow to proof for about 30 minutes. 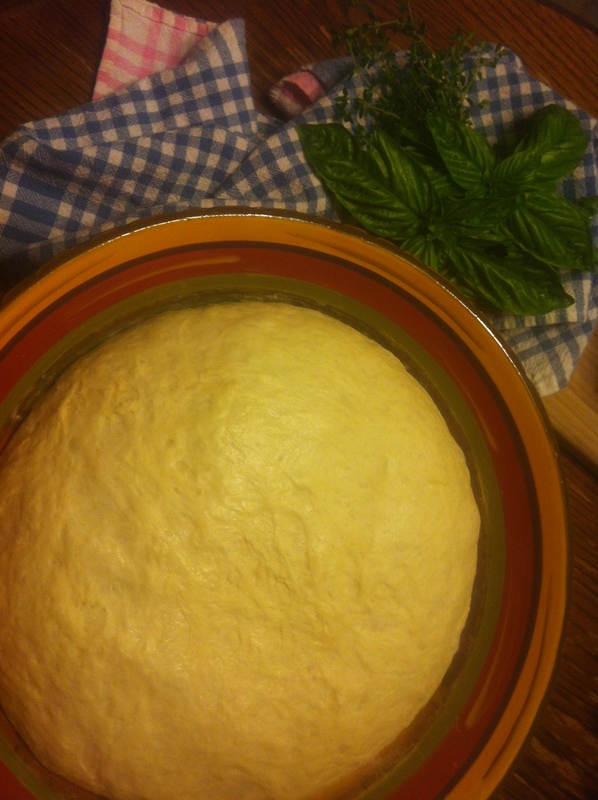 Divide the dough into 3 parts (as it’s easier to work with). On a clean, floured surface, sprinkle the 1/3 of dough with some flour. 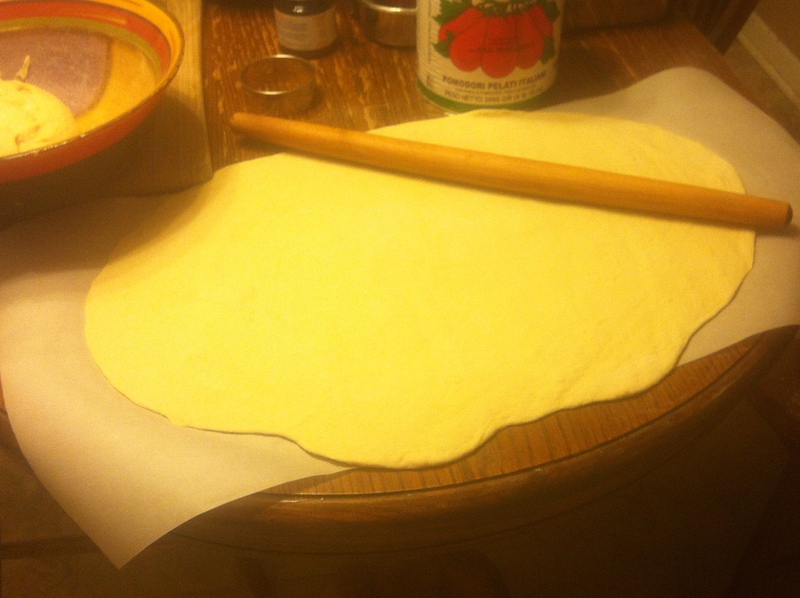 Using a rolling pin, roll out the dough to a 1/4″ thickness. Determine your size (the above dough recipe will easily make 4 to 5 – 8″ rounds or approximately 20-25 mini’s). Place the crust on a parchment lined baking sheet, puncture with a fork to avoid ‘bubbling,’ and bake at 415 F for about 8 minutes. This starts the cooking process and saves you time on the grill (where you will finish making them after your guests add their own toppings). Before placing on the grill, add your sauce. 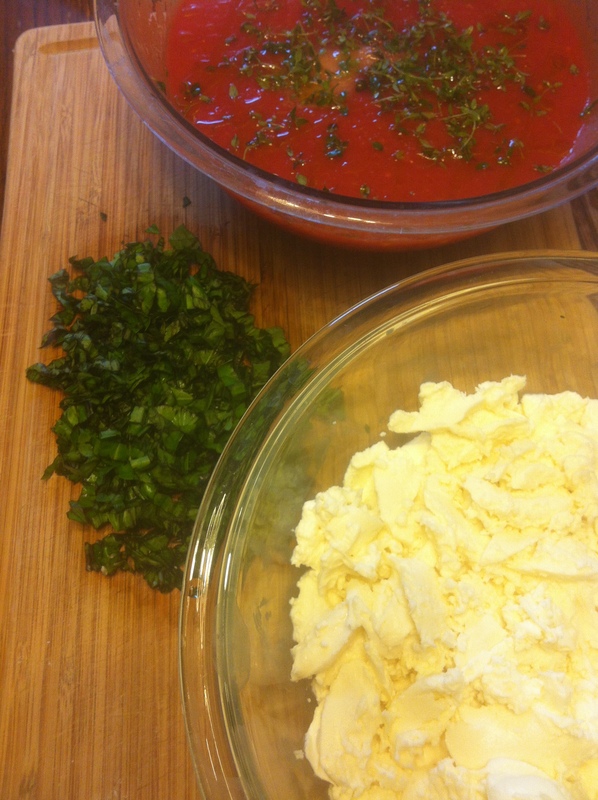 For an authentic Italian taste, purée Peeled Italian Tomatoes (I suggest San Marzano). For every 2 cups of puréed tomatoes, add 3 tablespoons extra-virgin olive oil, 2 tsp. salt, 1 tsp. sugar, 1/4 tsp. fine ground black pepper, and about 1/4 cup freshly chopped oregano. Mix and top pizzas. For the Mill River Park Pork in the Park BBQ Festival in Stamford, Connecticut, I decided to go super-traditional and make “margarita” pizzas – crust, sauce, fresh mozzarella, and topped with fresh basil. Once you make your ‘dream-pizza,’ place onto a medium-high heated grill and cook for about 3-5 minutes. Be extra cautious as they can burn quite easily – if you see they are blackening too quickly, lower the heat. “Per tutti” means ‘for everyone’ – pizza is that kind of food – very few don’t enjoy it, and it is so customizable to each person’s liking. I love the size. Your sauce sounds so wonderful. 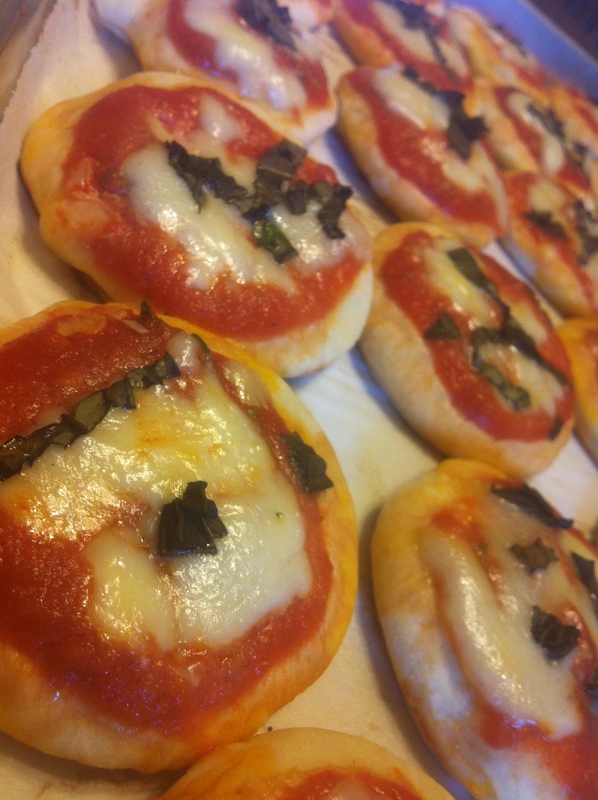 Perfect little pizzas. Thanks! 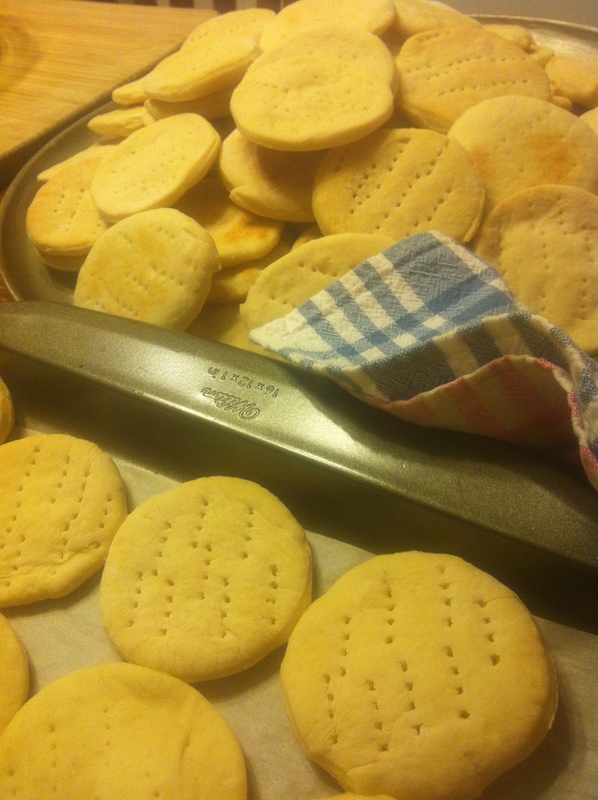 I used a cookie cutter – this dough is perfect for rolling out and cutting out! I made them like this for a cooking demo at a BBQ festival yesterday…worked great!